When: Saturday, March 24 at 7 p.m.
Halpern, who teaches on UBC’s Vancouver campus, will be in the Okanagan to explain the potential of the newly established Canadian Hydrogen Intensity Mapping Experiment (CHIME). His talk titled ‘CHIME: Lullabies of the Infant Universe, and characterizing dark energy in the Okanagan’ will explain the role of the new telescope in today’s study of modern astronomy. The telescope, located at the Dominion Radio Astrophysical Observatory near Penticton, began operation last fall. CHIME will help scientists learn more about how the universe grew and expanded by detecting and measuring the remains of sound waves in intergalactic gas. 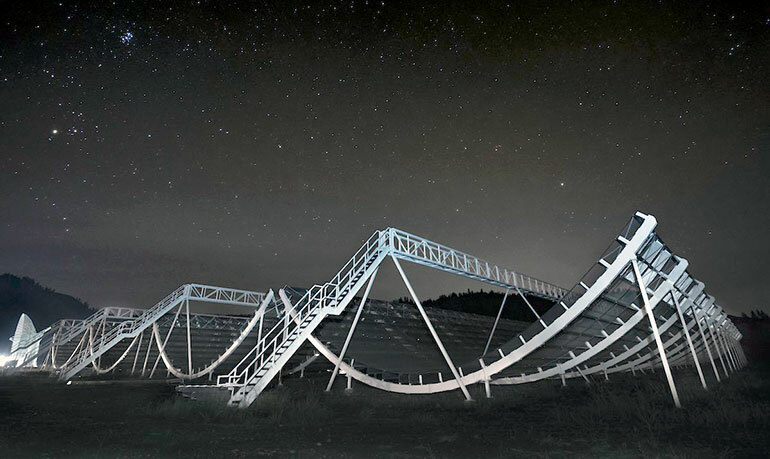 “The CHIME telescope will measure the expansion history of the universe and we expect to further our understanding of the mysterious dark energy that drives that expansion ever faster. This is a fundamental part of physics that we don’t understand and it’s a deep mystery. This is about better understanding how the universe began and what lies ahead," explains Halpern. There will be a Q&A session after his talk and, weather permitting, the audience will be invited to use telescopes—courtesy of the Kelowna Centre of the Royal Astronomical Society of Canada—located on the rooftop patio of the Innovation Centre. This event, co-presented by UBC Okanagan and Okanagan College, is free and open to the public but pre-registration is required: chime-2018.eventbrite.ca.